Lil' Dog Whisperer: Shar Pei ~ Wrinkles Galore! The Shar Pei, or Chinese Shar-Pei, is a breed of dog known for its distinctive features of deep wrinkles and a blue-black tongue. The breed comes from China. The name (沙皮, pinyin: shā pí; English name probably derived from British spelling of the Cantonese equivalent, sā pèih) translates to "sand skin" and refers to the texture of its short, rough coat. The plural for Shar Pei is Shar Pei which was really interesting to me. 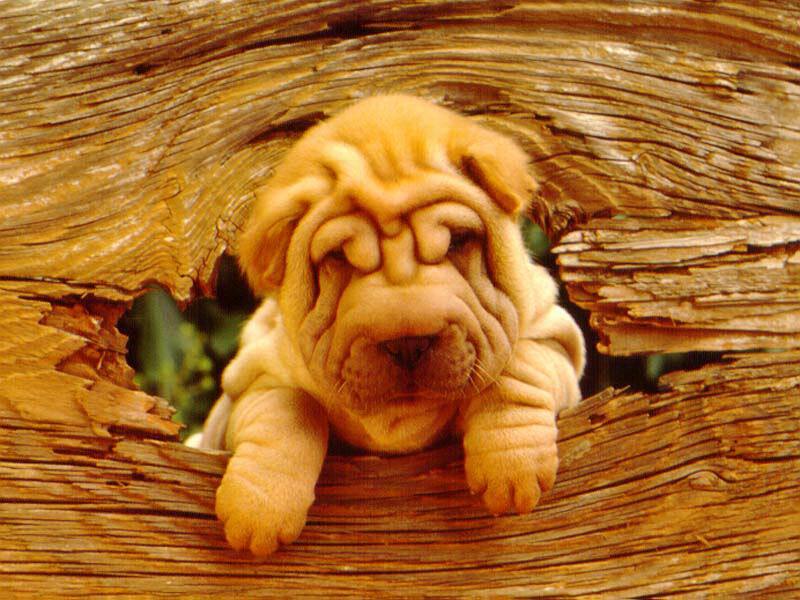 As puppies, Shar Pei have numerous wrinkles, but as they mature, these wrinkles loosen and spread out as they "grow into their skin". Shar Pei were named in 1978 as one of the world's rarest dog breeds by Time magazine and the Guinness Book of World Records, and the American Kennel Club did not recognize the breed until 1991. 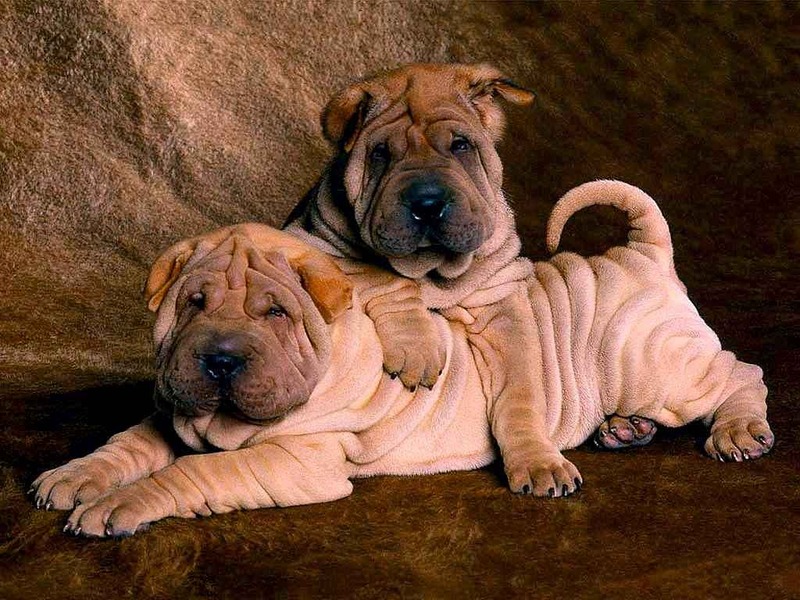 Western Shar Pei come in many different colors, such as fawn, red (rose), sand, cream, black, lilac and blue. They resemble the Chow Chow due to having the same blue-black tongue. There are over sixteen recognized colors in AKC. 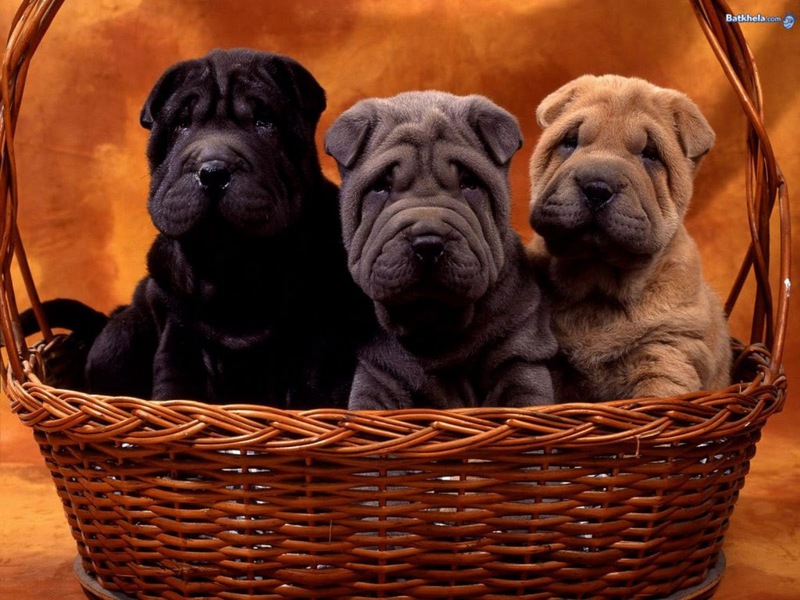 The coat must be solid in color, and any Shar-Pei with a "flowered coat" (spotted) or black and tan in coloration (i.e. German Shepherd) is a disqualification. Colors include black, cream, fawn, red-fawn, lilac, (The lilac is the hardest color to describe - it is like a purple mocha), red, sable, apricot, chocolate, isabella, (The isabella color is a light color - kind of a very, very light Khaki color. It is hard to see it in the pictures as the lighting often casts a yellow tint to the photo. It is like a platinum with a hint of taupe. It is related to the blue line), and blue. The nose may be black or brick (pink with black), with or without a black mask. 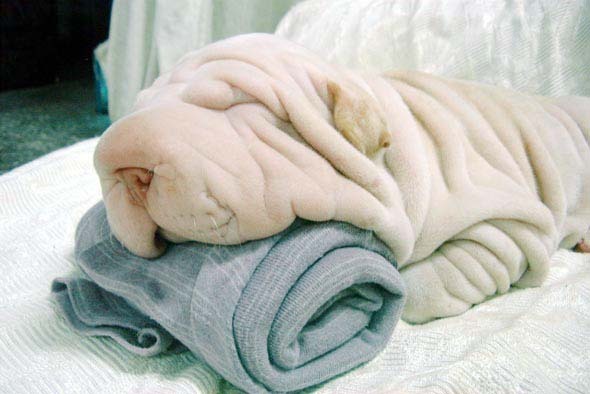 A Shar-Pei can also have what is called a "dilute" coloration. Meaning the nose and nails of the dog are the same color as the coat (i.e. chocolate coat with chocolate nose and nails). All of these color variations are acceptable and beautiful, but the coat color must be solid and well blended throughout the whole body of the dog. The Shar Pei is often suspicious of strangers, which pertains to their origin as a guard dog. In general, the breed has proved itself to be a loving, devoted family dog. They are also a very independent and reserved breed. Nevertheless, the Shar Pei is extremely devoted, loyal and affectionate to its family and is amenable to accepting strangers given time and proper introduction at a young age. If poorly socialized or trained, it can become especially territorial and aggressive. Even friendly and well-socialized individuals will retain the breed's watch dog proclivities (such as barking at strangers). It is a largely silent breed, barking only when playing or when worried. The Shar Pei were originally bred as palace guards in China. This breed is also very protective of its home and family, a powerful dog that is willing to guard its family members. The breed is amenable to training but can get bored from repetition. 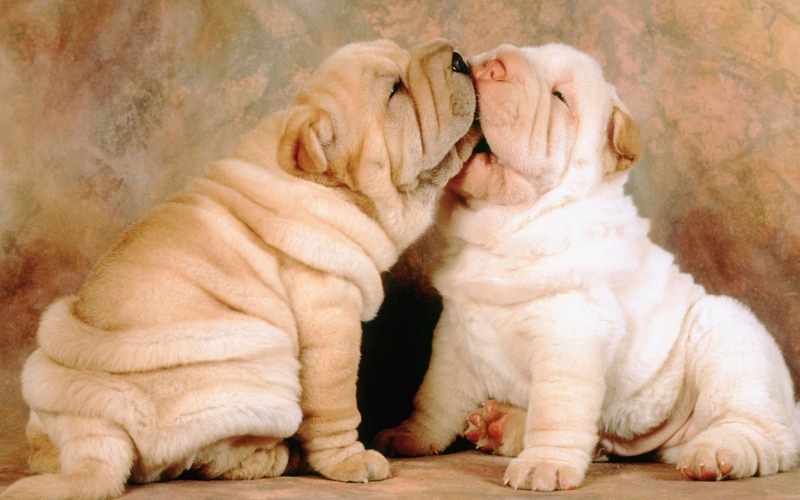 Overall, the Shar Pei is a dog that is loyal and loving to its family while being very protective and independent. It was believed in ancient times that the dark mouth, exposed when barking, helped to ward off evil spirits. At one point, the Chinese Shar Pei served as a guardian to the Royal Chinese Family before becoming virtually extinct under the rule of Communist leader Mao Tse Tung. Under the rule of the Communist leader, the Shar Pei was considered a burden because of the "wasted" food used to feed the dog. In addition, prior to the Communist takeover, Shar Peis were considered pets of the wealthy, a theory that is no longer valid or true under the new Communist regime. The Shar Pei had become so rare at one point that it was named the "rarest dog in the world". But by the late 1960s, its popularity began to pick up, and currently, the Chinese Shar Pei is the thirty-fourth most popular breed of the 134 listed by the American Kennel Club (AKC). Lao-Tzu, Martin Prince's dog in The Simpsons, appeared in two episodes: "Bart's Dog Gets an F" and "Two Dozen and One Greyhounds". Fu Dog from the Disney cartoon American Dragon: Jake Long is a Shar Pei. Kimmy Gibbler from "Full House" had a Shar Pei named Sinbad and a litter of Shar Pei puppies in one episode. Satchel, from the syndicated comic strip Get Fuzzy, is half yellow lab and half Shar Pei. In a British television advert for a Garnier anti-wrinkle cream, a Shar Pei puppy is featured. In Australia and New Zealand, a Shar Pei puppy named Roly has been used for many years in television commercials for Purex toilet paper. Zac Lichman from Big Brother had a Shar Pei named Molly, who undertook a task on Day 55 and was also reunited. G-Dragon from the popular Korean hip-hop group Big Bang has a Shar Pei puppy named Gaho. Gaho is featured several times in a documentary, GDTV, from Mnet as well as more recently in the lyrics and video of the song KNOCK OUT on the GD & TOP album by G-Dragon and T.O.P (entertainer). They are so cute! I really enjoyed reading your blog. 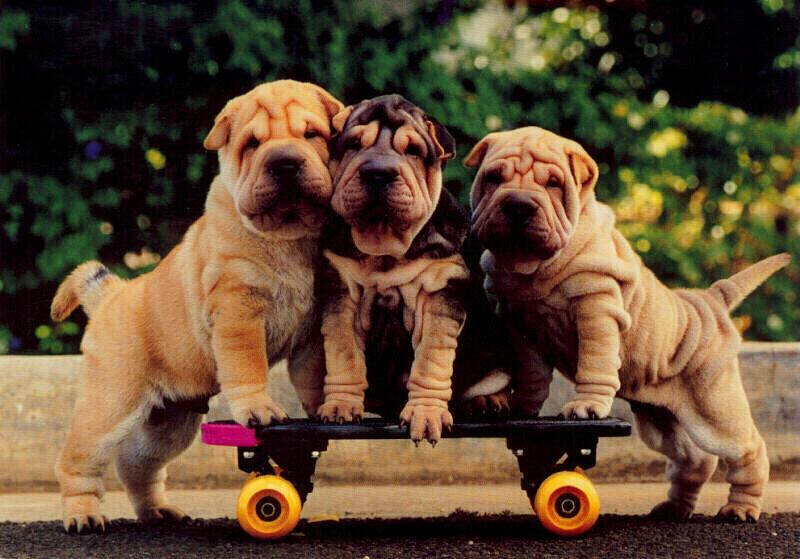 I love the Shar Pei! They are SO cute! Hello there! I could have sworn I've visited this website before but after browsing through a few of the articles I realized it's new to me. My website has a lot of completely unique content I've either written myself or outsourced but it seems a lot of it is popping it up all over the internet without my permission. Do you know any solutions to help prevent content from being stolen? I'd genuinely appreciate it. quick question that I'd like to ask if you do not mind. I was curious to know how you center yourself and clear your mind prior to writing. I have had a tough time clearing my mind in getting my ideas out there. I do take pleasure in writing but it just seems like the first 10 to 15 minutes are generally wasted just trying to figure out how to begin. Any recommendations or tips? Cheers! I would like to share with you and your readers more interesting information about the Shar Pei dog breed.